Bert hated to deliver on the South Side - everyone wanted change. "Sorry. All I have is a pocketful of secular humanists." "Sorry. I'm not allowed to carry anything bigger than a Scientologist." On second thought kid, just keep the pizzas and the Episcopalian. I'm in the mood for snake and pygmy pie. Holy Cow Where did you get those ears? Oh and please don't boo! I'm so over it! I'm too busy laughing and have no witty comments. My wife and I do most of the cooking at church. I have to share this. 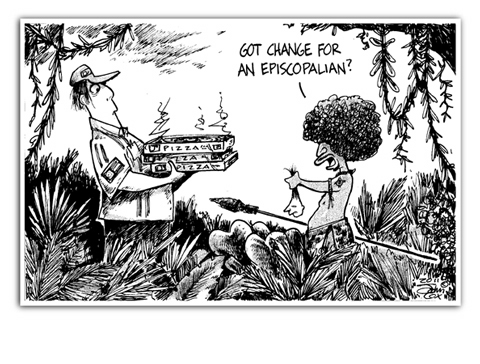 Sorry, we no longer accept Episcopalians now that their value has shrunk. However, a couple of Baptists "on the rocks" would do. Sorry, just having some fun is all. This page contains a single entry from the blog posted on September 12, 2011 4:01 PM. The previous post in this blog was In Memoriam. The next post in this blog is Assad Caricature Used in Rally!.